The 16th Annual Wings Over Water Birding Festival March 16-18, 2018 in Blaine, Washington celebrates the incredible variety of migratory birds that flock to the coastal waters of Drayton Harbor, Birch Bay and Semiahmoo Bay at the northwest corner of Washington State. This major stopover on the Pacific Flyway between Seattle, Washington and Vancouver, BC is designated as an Important Birding Area (IBA) and is the anchor for the North Cascades Loop of the Great Washington State Birding Trail. The festival will take place at various locations in the Blaine, Semiahmoo Spit and Birch Bay areas, as noted in the festival map and schedule. 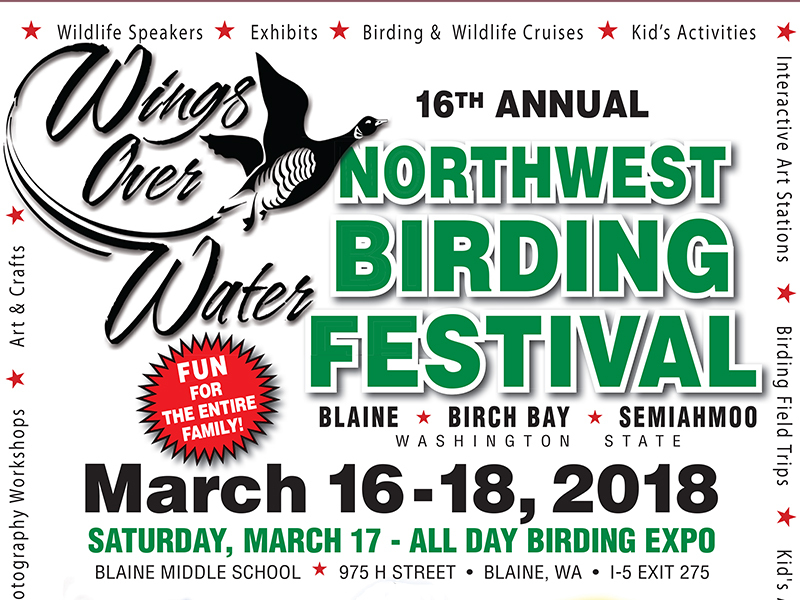 On Saturday, March 17, the festival headquarters and all day birding expo will be located at Blaine Middle School and Blaine School Performing Arts Center, 975 H Street, Blaine, WA. Sunday’s events take place in Birch Bay State Park at the BP Heron Center, 7290 Birch Bay Drive, Blaine, WA. This entry was posted in News and tagged Birch Bay Plunge, Birch Bay Polar Bear.